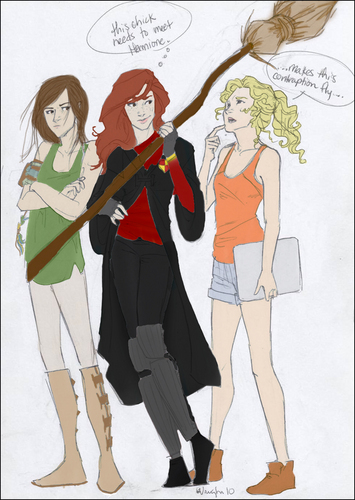 katniss, ginny, and annabeth. I was bored and, well, I loved this image, so, why not color it in? I don't think I got most Farben right, but, what the heck!. HD Wallpaper and background images in the Helden des Olymp club tagged: the heroes of olympus annabeth heroes harry potter hunger games katniss ginny. what are katniss and GINNY (you spelled it wrong) doing on the heroes of olympus? but your right it's really cool and i love how you did ginny! u should do 1 were hermione and annabeth do meat.............!! i agree magicgirl123! that would be funny! Its a picture form Burdge-bug, I love it! Riptide, being negative is Katniss' fatal flaw. And you did color most of the colors right, but Katniss' hair is black and her skin darker, but its fine. HecateA, really?? I thought her hair was brown... thats how i pictured her. Katniss looks is trigger happy right there God I'm glad she doesn't have her bow or gun.